I’ll note here that a few of the episodes are out of order compared to how they were originally aired. For instance, the first episode of the season, “The Mutation Situation,” ends with a stinger for “Invasion of the Squirrelanoids,” which was the second episode of the season aired, but is the third episode on the DVD. This isn’t a big deal, as “Invasion of the Squirrelanoids” doesn’t tie in with the major arc of these first couple of episodes except vaguely, but it still leaves that stinger orphaned. The turtles intercept a Kraang transmission on their captured Kraang communicator, and learn of a shipment of mutagen the Kraang are preparing for Shredder. When the turtles try to stop the shipment, they only end up dropping mutagen all over New York in general and April’s dad in particular. While I did say the second season is off to a good start by the end of this DVD, this isn’t actually the best start to the series, as it has major tonal problems. The episode is goofy as ever, which would be fine, if it weren’t also trying to play up Kirby O’Neil’s transformation into a giant bat for drama and horror. Cutting between the horrific transformation and the turtles battling a goofy Kraang Biotroid just doesn’t work. The Kirby Bat design is also not very interesting from a furry point of view; it’s very, very ugly. That’s not really a bad thing, as very, very ugly was presumably what they were going for, but it’s probably not to a lot of furries’ tastes. As pointed out above, this episode is out of order, technically, but either this or the next one is fine in the second position. In fact, this one does have the advantage of setting up the other major storyline of the early second season episodes, where Shredder goes out of town and Karai is now interim leader of the Foot. This is another lesson based episode, where Leonardo learns that it’s better to nurture his brother’s unique styles rather than force them to do everything his way when Karai unleashes a group of robotic Foot soldiers that learn fighting styles automatically. It also deals with the complicated relationship between Karai and Leonardo, just so we don’t forget that Donatello and April do not have a monopoly on rocky inter-species relationships in this this show. Hey, it’s been a while since we’ve had one of those weird, balls-out horror parody this series has an inexplicable love for. Looks like it’s time for a nutty take on one of the most beloved horror icons of all time (well, if you can call horror icons “beloved”, anyway). At one point, Mikey even freaks out and shouts, “Game over man!” just like a character in that one James Cameron movie with the aliens (I think it was called Avatar). Setting aside that this is a whole plot reference down to the decapitated robot scene, it’s also a loving tribute to horror clichés as a whole. Splinter suggests they split up to search for the Squirrelanoids! No, Splinter, no! And even when you think the monsters are gone, one pops back up for one last jump scare. Some people might call this a filler episode, with very little in the way of advancing any season long story arcs, but these little side trips have produced some of my favorite episodes of this series. This episode begins with our introduction to the Team Mecha Robo Force Five!, which is just so mean. I love it. So they’ve been Trekkies and anime fans. I can’t wait until the turtles become copyright friendly bronies next season. Anyway, this episode also introduces some inconsequential character I’m sure we’re not going to be seeing much of. Casey Jones, or something. His appearance as a potential love interest for April that isn’t Donatello causes jealousy in both the aforementioned turtle and, surprisingly, Timothy the mutated blob, who also develops a mutagen addiction, which allows him to transform into Mutagen Man. Technically, that episode title is incorrect; Mikey does not get any form of acne. He decides to steal some of Donatello’s experimental retro-mutagen as a sort of performance enhancer for mutant ninjas, only it ends up giving him zit like protuberances all over his body. In fact, I don’t think turtles can get acne; I think that’s a mammals only problem, because of oil production for hair. Speaking of mammals, Dogpound also manages to have a second run in with mutagen, double mutating him into the more wolf-like Rahzar. This DVD ends with a bit of an arc for April. After spending most of these episodes deciding she hates the turtles’ guts, Casey inadvertently reminds them they’re her friends. Also, Karai sends a giant robot named Chrome Dome to kill her. 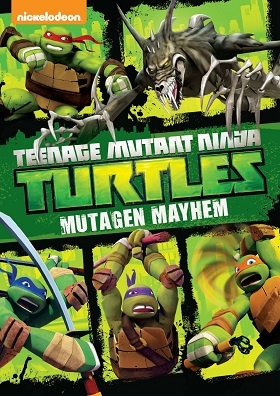 The DVD contains the normal making of “Mutation of a Scene” bits, and also features a mock “Channel 6 News Special Report,” which covers the various mutant creatures the turtles have fought covered as cryptid like monsters.